SBook5 is now an abandoned project. The complete source code, including the AI engine, is now being made available to the community. Note: SBook now requires MacOS 10.4; you can still download version 5.15a, the last version that ran on MacOS 10.2! 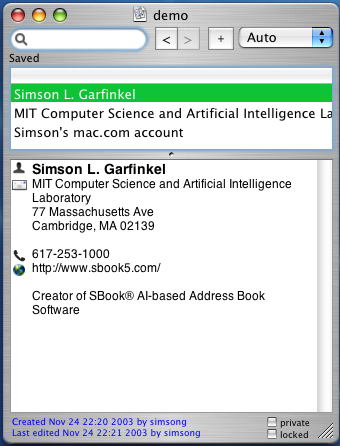 SBook®5 is an extremely fast, AI-based personal information manager. Information is organized in free-format entries --- one for each person or company. Each entry can have any number of postal addresses, phone numbers, email addresses, photographs, URLs, and other information. SBook5 automatically tells the difference between an entry that represents a person and one that represents a corporation, and sorts accordingly. The database then sorts entries as you would, if you only had the time. SBook uses an artificial intelligence engine to recognize information in each free-form entry. SBook provides for transparent multi-user access to files shared over AppleShare, two-way synchronizing with Apple AddressBook, and automatic export of vCards to the Apple iPod. Searching algorithms are blindingly fast and intuitive --- far more powerful (and useful) than simple string-search. Can rapidly import and export data in a wide variety of formats. Can dial the phone using a modem; a second expert system for properly handling area codes and foreign exchanges. A third expert distinguishes between companies and people. SBook catches keyboard events and interprets them in a way that feels very intuitive. For example, if the word Name is highlighted in an entry and you paste multiple lines, the first line is pasted into the Name line, the font is switched, and the rest is pasted where the word Address appears. Such attention to minutiae is present throughout the program. Up and down arrows in the search field change the selected entry. Entries can be dragged into Apple Mail messages for sending to others, then dragged out and into the recipients SBook file. SBook provides MacOS X Services for envelope printing and creating new entries. SBook5's searching algorithms search in the blink of an eye. Just type a few characters from the person's name, and SBook5 instantly finds the right entry. Don't know the name? No problem --- SBook5 automatically downshifts to full-text search mode, automatically finding all entries that match what you type. SBook pioneered this style of searching back in 1991! Support for Cocoa's most modern features, including drag-and-drop, rich text, and services. SBook databases can be encrypted with 128-bit blowfish, for unparalled security. Stores database in XML, to make it easy to interoperate with other applications. Automatically finds and identifies names, phone numbers, email addresses, URLs, and other kinds of information. SBook5 is derivative work of SBook3.0. The original SBook technology was developed by Simson Garfinkel in 1991. In 1993 Garfinkel licensed SBook3.0 to Sarrus Software in a contract that retained derivative rights. SBook5 contains no code that was authored by Sarrus Software. SBook5 is also a trademark of Simson L. Garfinkel. This document is located at http://simson.net/ref/sbook5/index.php.